"A Momentary Lapse Of Reason", one of my favorite Pink Floyd albums... A momentary lapse of reason. Also a very nice English phrase which is sometimes used to define "losing mind for a moment". 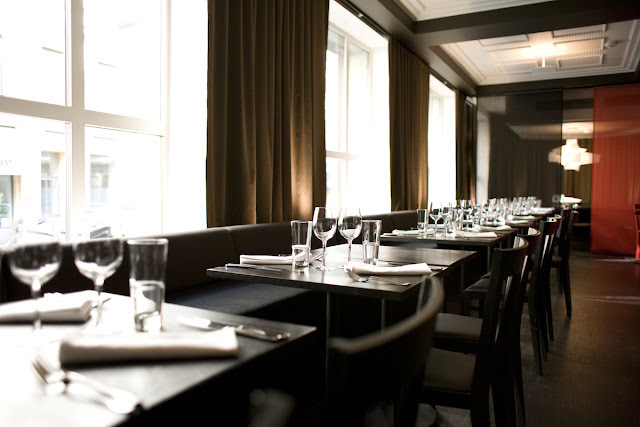 There is a restaurant in Helsinki, Grotesk, which the restaurant manager and sommelier Paul Hickman (and a good friend before all) started to sell the restaurants' wines for such prices with a very unexpected calculation method since more than a year now. Now I will write here his method of calculation. You will probably think that he lost his mind, maybe he has "a momentary lapse of reason". But no, actually what happens in Grotesk is a momentary lapse of Riesling! 56.29 + 56.29 x 0.24= 69.80€ is the price you will pay. Crazy. Right? But why he does that? I did ask. What he said is that he is willing to change the wine culture and the idea of wine drinking in a restaurant by finding a method which will keep them survive but also make the customer to be able to have more wine without fear. True, most of us are anxious about prices in a restaurant when we are having a meeting with friends or going out with someone special. Also, wine is a culture, Finland must see this truth someday, people get drunk and lose their health shot after shot filled by heavy alcohol, but wine should not be considered as heavy alcohol, wine is a culture, is a liquid form of art, it is comfort food; it is meant to enjoy slowly, it is not something you can get drunk on if you really dont drink 2 liters of it alone in half an hour, which makes it never possible to enjoy! So I think Paul did a very "aggressive decision" with this method and started to run it since more than a year. There are anyways only few really wine-driven restaurants in the town and if the restaurants, sommeliers and bloggers do not act, the wine culture will never improve. May your glass be filled with fine wines. Greetings.